Old Abe was a crotchety, but pious, feller roundabouts 86 years and climbing. He had fine-looking wife named Sara, who also happened to be his half-sister. But they didn’t care. Because she was hot! But Sara was also barren. Still, she wanted her husband to have everything his big ol’ heart desired. “Oy vey, Sarah! I need some children sprung from these here loins!” Abe said. Since they hadn’t invented feminists yet, Sara got the bright idea that she would make a present to her husband of her attendant, a right nice Egyptian lady named Hagar, who would be Sara’s surrogate. Hagar made Abe a happy man, indeed: along came a little bundle of joy named Ishmael. Later, it turned out Sara was actually fertile, so she gave birth to Abe’s second son, Isaac. Now, there were about 13 years between Isaac and Ishmael, but wouldn’t you know, they got circumcised around the same time? It’s no wonder, then, that Ishmael, having been circumcised while lucid, got to picking on his half-brother, Isaac, who was barely weened. And Sara, being literally the mother of all Jewish mothers, wouldn’t stand for her brilliant boy taking any flack down at the pre-school. So she said, “Off with her head!” Just kidding. Different story. Anyway, let’s just say: Sara and Hagar parted ways. Hagar, next time we meet her, is hanging out by a divine well out in the wilderness. And Abe was so relieved that he sacrificed the first animal he could, which happened to be a ram whose horns were all twisted up in the briar patch. I’m always lecturing my students in both America and Morocco on the importance of not being vague in their writing. And while most of you reading this will assume the son I’m talking about is Isaac, grammatically speaking, which one was it? Today, in Morocco, it’s all about Ishmael. It’s Eid Kibir, or Eid-al-Adha. Almost every family has a ram, and today, just like Abraham, Muslims will make a sacrifice. And if they couldn’t afford to buy their own muton, someone else will likely have bought them one, or at least invited them to join in on the festivities. There are rams everywhere. 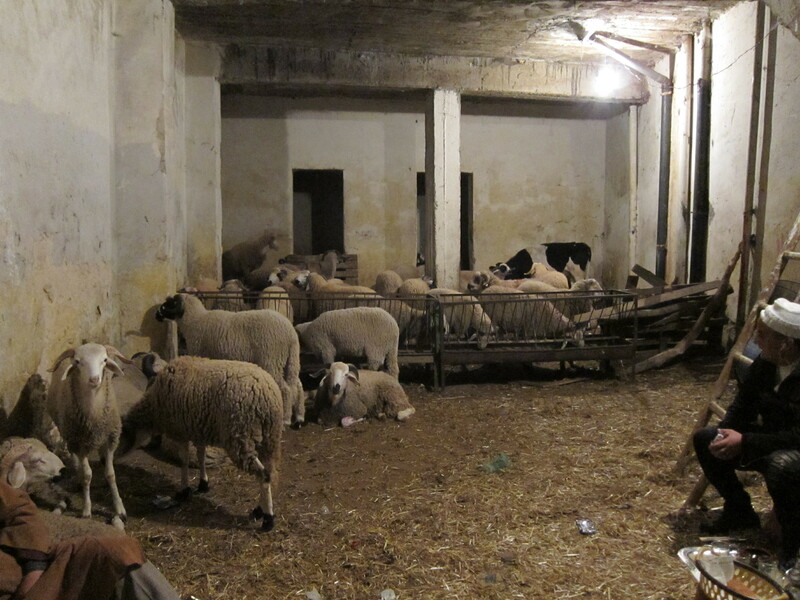 For the last few days, I’ve heard mutons bleating from rooftops and windows and garages-turned-farmyards. I’ve heard them in my hallway. Almost every time I’ve left my apartment building, I’ve seen a group of men wrestling a ram out of a small truck. 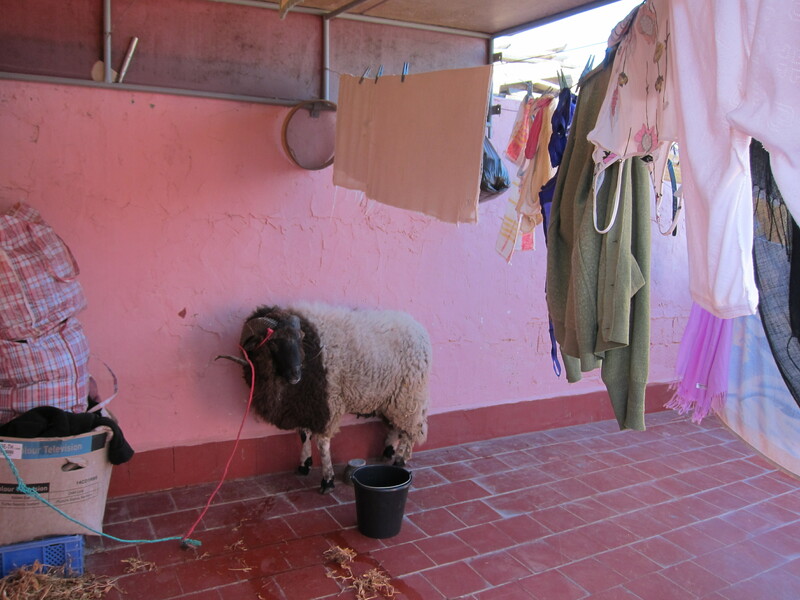 There are rams on the tops of busses, in wheelbarrows, in bathrooms, on terraces, on balconies. 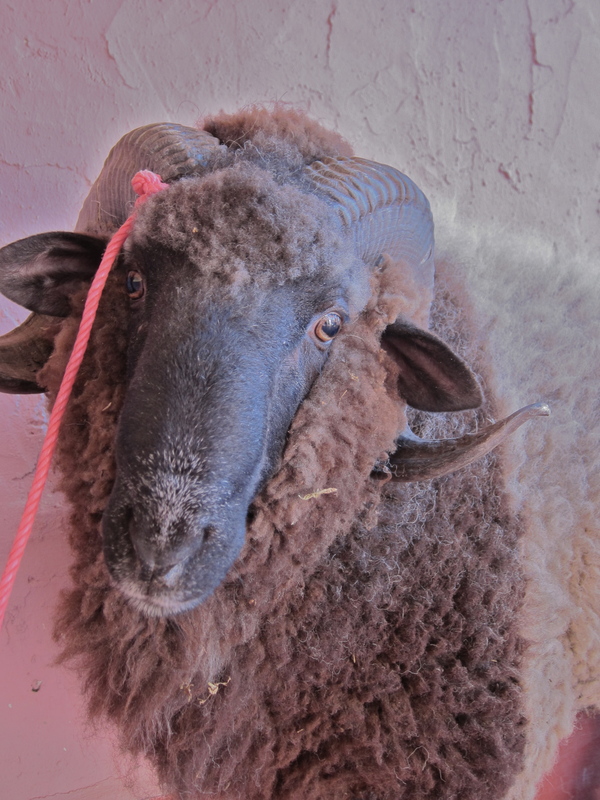 But my favorite muton moment was yesterday morning: I was waiting for a petite taxi on Mohammed 6, when a ram came charging past. 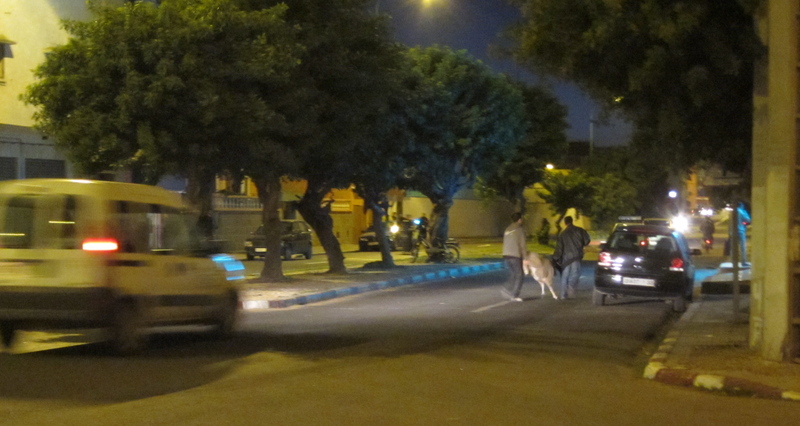 Shortly thereafter, 10 Moroccan men came sprinting around the corner, hot in pursuit of the furry fugitive. Strangers on the sidewalk joined the herd of shepherds. I didn’t stick around long enough to see if they captured the little guy, but I didn’t need to; his fate’s inevitable. The Road to Marrakech is Paved with Vocabulary Words. The woman sat next to me, pressed my body against the public bus window. -Salaam, I offered while adjusting my bags and my position. She ignored me. My traveling companion was a big woman wearing a sage veil, and I’d watched her board with a younger woman and two children. She had lots of wrinkles around her eyes, which I imagined she’d acquired from hawkishly watching the other three. Every few minutes she twisted her neck to scope the back of the bus where the others sat. Unquestionably, this woman was the matriarch of her family. There are many differences between men and women in Morocco, but one of these is the palpable sense of ownership, of control, of fearlessness, of sagaciousness, that an older woman often embodies. I suppose I could use some of the same words to describe both my grandmothers, women who presided over their households in America. But it’s different. I don’t want to use cliché phrases like “a lifetime of hard-work” to describe the women here. Because while that’s true, both my grandmothers’ faced their own struggles and worked very hard. Maybe what I’m looking for is a sense of connectedness to the land, of using hands and feet and backs to make a life. I’m not sure. Think of that famous Dorothea Lange Dust Bowl photo of the woman with her children, and you’ll see a face that expresses what my words fail to do. Ten minutes into our trip, my seatmate eyed me skeptically. -Labas, I tried. -Shnu? she asked, almost aggressively. As if I’d rudely asked her to move over. -Labas? Bexair? Hi, are you well? I smiled. Then, the woman started to chortle – one of the loudest, heartiest laughs I’ve ever heard. The entire bus turned around to look at us. -Bexair, Hamdoullilah. You speak Arabic? -Chwiya, I explained. Only a little. She laughed again and slapped my knee. I giggled. And then she announced to everyone that the American spoke Arabic. She told me a little about where she was going, about her family and wanted to know what my exactly my travel mug was. I tried to explain that it kept my coffee warm for hours, that I usually ordered two café nus-nus to fill it up before a journey. She didn’t believe me, so I unscrewed the lid and together we watched the steam rise. When she got off the bus half-an-hour later, the skinny woman with a pointy nose across the aisle slid in beside me. It was obvious she wanted to talk, so I asked her for her story: Where was she from? Where she was going? Who was she meeting there? She wanted to see my mug, too, and when I pulled out my red aluminium water bottle, she was equally amused. Neither of the women spoke French or English. My Arabic is so limited that conversations always stay on the surface. Still, I’m always grateful for the practice. 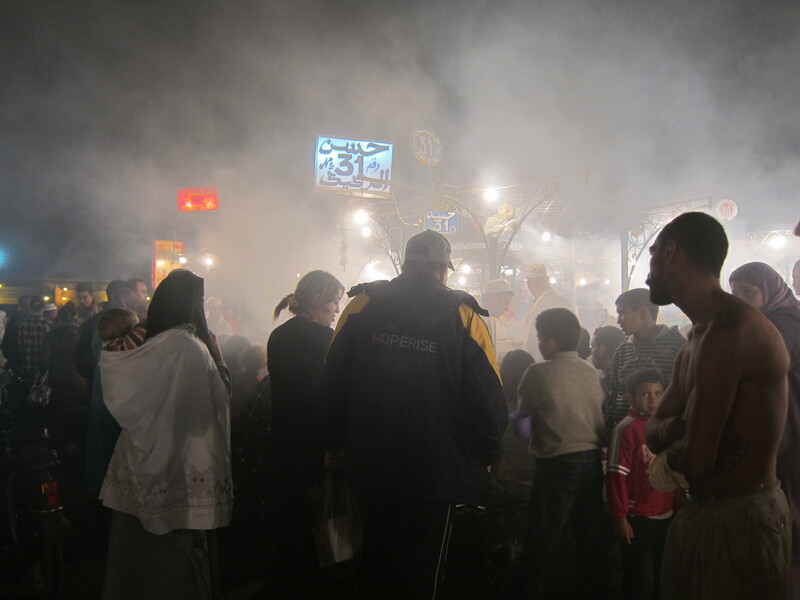 And every person I meet teaches me something new about Morocco. The second woman exited at Sidi Bennour, a town that’s home to many of my students. She invited me to visit her there or in El Jadida. When she left, two small children appeared in the still-warm seat. They were shy at first, but soon, like children from any country, we were playing and laughing and talking freely. I often find children a great relief because our language skills are a closer match, and because the world is so filled with magic for them – just as Morocco is for me. The bus stopped mid-way between El Jadida and Marrakech for a break. I didn’t brave the stretch I badly wanted, because I couldn’t figure out how long our halt would last. I’d watched four men help an old woman hop onto the already departing bus back in El Jadida, and I knew I wasn’t ready to perform such a trick in the event it was necessary. Men boarded proffering bags of clementines and bananas bunches for 5 dirhams. A hunched back woman climbed aboard, asked for change. Another man lectured the crowd for about 10 minutes. He was selling something – a product, a political notion, I’m not sure. I tried to talk the fruit vendors into selling me one piece of fruit for a dirham, but none of them would bite. I gave the old woman my dirham instead. Baraka, indeed, because soon after I gave away my coin, the mother of the children flanking me offered me a banana and a clementine. The children spent the rest of the journey teaching me Arabic prepositions, which we demonstrated with one of the tiny oranges. Fuq: above. Thht: below, Mura: behind, qddam: in front. I taught them to count in English to the tune of Twinkle, Twinkle, Little Star. Soon, we were deep into the desert and the number of degrees inside the bus escalated. The kids taught me the word for hill, and for cow, and by the time we entered the outskirts of Marrakech, I had learned so many words that I was starting to forget everything. The kids took turns sitting on my lap. At the bus station in Marrakech, the children shouted “Au Revoir, Erin!” until I couldn’t see them anymore. I hopped into a petite taxi, and headed to Djma El Fnna to meet my friends for a weekend of food and shopping and laughter. Since this entry is already long and you can read about the awesome, but very touristy city of Marrakech everywhere else on the web, I’ll leave you with my photos and their captions and an offer to give you more details upon request. My new friend Kate, posted a great bargaining guide on her blog, so if you’re visiting Morocco and want to shop, make sure to read her tips first.